Molly loves to record video of our kids; there's never a unique moment that she wants to pass by without catching it on camera. We've had this huge, probably 15-year-old camcorder that we've been using for quite a while, and it's not exactly the easiest thing to just whip out on a whim if you want to catch one of those unique moments. In fact, most of the time when Molly says, "We should get this on video, can you get the camcorder? ", I just say, "umm... no." It's a hassle. But, I've had my eye on a solution for a few months and finally pulled the trigger and purchased it for Molly's Mother's Day present this year. It's the Flip Mino Camcorder. 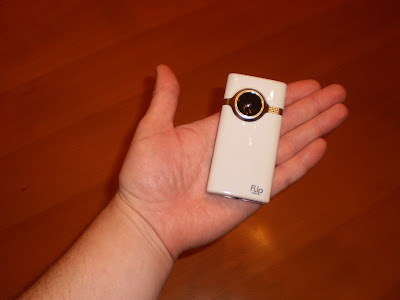 It's super small, super light, easy to use (just a few buttons), records up to 60 minutes of video, and makes it easy to save and share videos. It's even darn cheap for a camcorder. For any techies out there, it's also purely flash-based memory so there are no moving parts and reliability should be off-the-charts better than any standard camcorder that uses tapes or discs (or a hard drive). Speaking of how easy it is to save and share videos, it has an integrated USB connector so you just plug it into your computer and save videos. From there you can post videos to the web or burn to DVD easily with the software that is included on the device. You can also string together multiple clips into a "movie" very easily. There are, of course, downsides to a simple, small design. There is no zoom to speak of, which is probably the biggest downside. There is a 2X digital zoom that you can use, but it just enlarges the digital picture and it ends up kind of blurry. There also isn't any image stabilization technology, so if you are walking or moving the picture can get a little bumpy. All-in-all though, for our needs it's a 95%-of-the-time camcorder. I would only use our old one for a concert or show that our kids are in, where you might need to record more than 60 minutes of video in one sitting and you'd need the optical zoom. Molly has already used the "Flip" quite a bit to record the daily travails of our kids, and I've enjoyed watching the clips when I get home from work. This will also be a handy device for when we (God willing... please!) start construction and we can record construction progress videos and post them here on the blog. Molly and I take turns going on "dates" with each of the kids as special one-on-one time, and just today it was Eleanor's turn to go on a date with me. And she chose for her date to go to the Minneapolis Institute of Arts! Since Eleanor enjoyed the Art Challenge so much, I thought this would be a good idea even though she's so young. As you'll see, she had a great time. This video shows how the software included on the Flip can be used to string together multiple clips into one movie (even with a title at the beginning). Enjoy! She is amazingly adorable! I agree with her though, I thought that urn was a drinking fountain too. AND, I'll bet there've been a fair amount of "time outs" on that bench at the art museum! If you could bottle all that cuteness, you could make a gazillion bucks! In Honor of Doctor Brendan Early Koop, PhD. Friday, May 8, 2009 - A Great Day!